The Dhoom 3 team recently met the press in Chennai and patiently answered a plethora of questions posed at them. 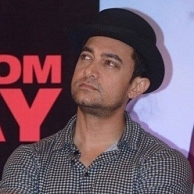 Aamir Khan, the lead hero, was asked if he had indeed expressed an interest in remaking K.Balachander's yesteryear classic Unnal Mudiyum Thambi, as reported in certain sections of the media. It must be noted that Aamir met the legendary director at his Chennai residence last week when he had come to the city for the inaugural function of the CIFF. Unnal Mudiyum Thambi is a movie starring Kamal Haasan and had many messages relevant to the society. Aamir answered in the negative and said he hadn't discussed about remaking this movie. He wondered where this report originated from. But Aamir took the opportunity to again say how much he respected and revered KB and how he was such a humble man despite his glowing achievements. Aamir also recollected the most emotional night of his life as an actor when he received the Gollapudi Srinivas Award, with KB also in attendance on the occasion. People looking for online information on Aamir Khan, K Balachander, Kamal Haasan, Unnal Mudiyum Thambi will find this news story useful.